At the beginning of this week, the BBC started a year-long project following a standard forty-foot container as it moves around the world carrying a variety of commodities. On Monday it left Southampton, and was taken by train to Coatbridge, then by road to Paisley. There it received its first cargo, a consignment of whisky destined for export to the Far East. 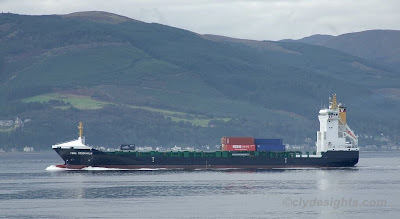 This afternoon, the 'BBC Box' was loaded aboard VEGA STOCKHOLM at Greenock Ocean Terminal and, with its bright red livery, was clearly visible on her deck as she sailed past McInroy's Point for Belfast and Southampton. The container has been fitted with a GPS tracking device to allow its movements to be followed. For more details about the project, visit the BBC website. Good to see the box starting its journey. Finally, an independent picture of the box actually on a ship! article. You would retain copyright, but with the benefit of allowing wider use and getting the picture seen by more people.